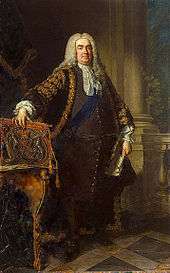 Henry Boyle, 1st Baron Carleton PC (12 July 1669 – 31 March 1725), was an Anglo-Irish politician of the early eighteenth century. The son of Charles Boyle, 3rd Viscount Dungarvan, Boyle was educated at Westminster School and Trinity College, Cambridge. and entered the army under the auspices of his uncle, the Tory politician Lord Rochester. However, Boyle himself became a Whig, and in 1688 deserted the army of James II in favour of the Prince of Orange. In 1689, he was elected to the Parliament of England for Tamworth, but was defeated the next year. He spent the next two years in Ireland managing the family estates and represented Cork County in the Irish House of Commons in 1692. In the same year, he returned also to parliament for Cambridge University, and became a prominent spokesman of the "country" opposition, but in 1697 he switched to the court party. Here he advanced quickly, becoming a Lord of the Treasury in 1699 and Chancellor of the Exchequer of England in 1701. 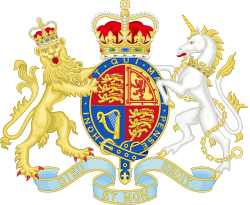 He picked up other offices as he went along, becoming Lord Lieutenant of the West Riding of Yorkshire and Lord Treasurer of Ireland in 1704, and was elected member for Westminster in 1705. 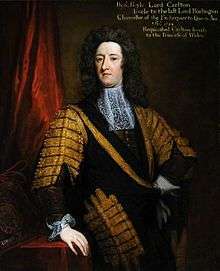 With the departure of Harley and his followers from the government, Boyle became Secretary of State for the Northern Department and Lord Treasurer Godolphin's principal lieutenant in the Commons. His and Godolphin's dominance in the ministry was increasingly overshadowed by the power of the Junto of Whig aristocrats, however, and in 1710 he retired from office and withdrew from politics with the arrival of Harley's new Tory ministry. 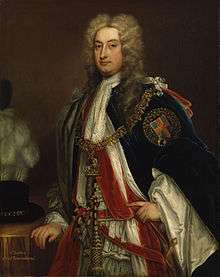 With the Hanoverian succession in 1714, Boyle was raised to the peerage as Baron Carleton, and became Lord President in 1721, an office in which he continued until his death in 1725. Carlton Way, a road in north Cambridge that follows the path of the Roman Akeman Street, and the public house The Carlton Arms on the same road, are named after him. ↑ "Boyle, the Hon. Henry (BL692-)". A Cambridge Alumni Database. University of Cambridge. ↑ Gray, Ronald D; Stubbings, Derek (2000). Cambridge Street-Names: Their Origins and Associations. Cambridge: Cambridge University Press. pp. 2–3.